Are there ever enough toys? Our cats do not think so. Its hard to pick just one so they go back and forth constantly! My cat bro Bert is astonished you haven't devoured the catnip banana! 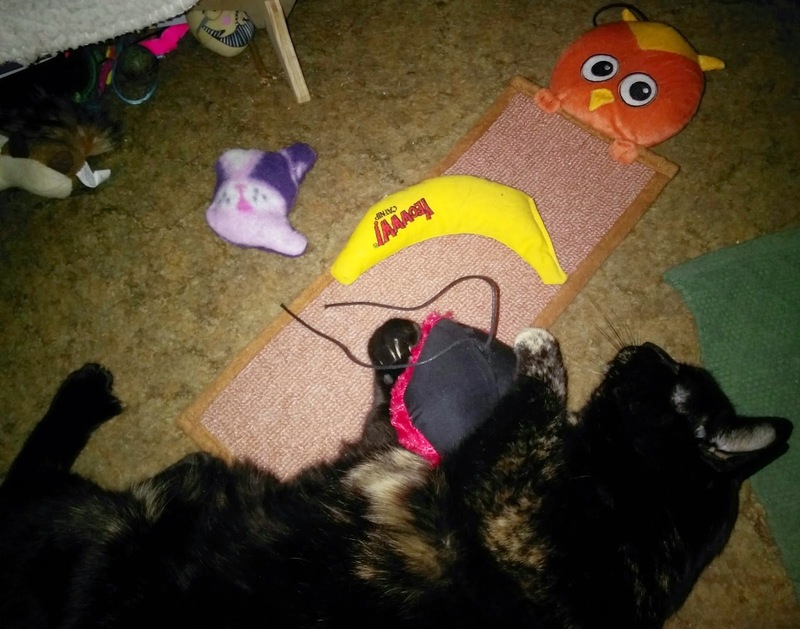 Looks like some cool toys there, especially the banana, I assume it's catnip flavoured! Sounds like a purr-fectly good plan, to me, Truffles! We're glad you have help picking all of those toys up! It's always nice to have someone pick up after you. Sounds familiar! Every time Mom picks up all our toys and puts them in the toy basket, Sophie goes back over and pulls them all back out! It's like a game... MOL! Truffles I think you have the greatest ideas! Kilo loves bananas, he'd go nuts if he was there. We think it is time for a new toy! Some days you just need to have all of your toys within paw's reach! I never take anything out or play with anything unless TW plays with me. My favorite game is ZOOMIES! followed by the red dot. Truffles, yous my kind of Cat From Hell! Enough toys? Are you kidding? I just play wif em all.